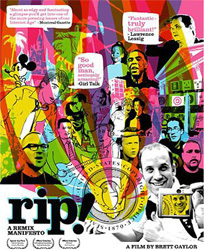 Synopsis: The feature documentary RiP: A Remix Manifesto explores the complexities of intellectual property in the era of peer-to-peer file sharing. Web activist and filmmaker Brett Gaylor interviews key figures in the debate, including the film’s central protagonist, Gregg Gillis, the Pittsburgh biomedical engineer who moonlights as Girl Talk, a mash-up artist rearranging the pop charts’ DNA with his incongruous, entirely sample-based songs. But is Girl Talk a paragon of people power or the Pied Piper of piracy? A mash-up in itself, RiP is the world’s first Open Source documentary, shattering the wall between users and producers and challenging the thresholds of “fair use”. Brett shares his raw footage at , for anyone to remix. RiP’s movie-as-mash-up method allowed these remixes to become an integral part of the film. With RiP: A Remix Manifesto, Gaylor and Girl Talk sound an urgent alarm and draw the lines of battle. Which side of the ideas war are you on? Let me start with this: this documentary dramatically altered my perspective. Before seeing this film, I was firmly entrenched in the copyright camp. I (still) believe that, as the creator/inventor of anything, I should be entitled to reap the rewards that come with the use of said invention. I think that this right should be protected. However, this film has found a way to convince me that culture is dependent on access to so-called intellectual property and that our present is built on the past, as our future depends on the past and our present. This being said, I now believe that limits have to be set on the wrenching control that has been placed on intellectual property. The film begins with the issue of music, in particular a sampling artist named Girl Talk who creates songs strictly out of samples (up to 200 per song! ), and then takes the argument into many other realms, including cinema and science. It congtains interviews with lawyers, legislators, artists, filmmakers, activists and many others to get a decent sample of the breadth of discourse on the matter. It also provides countless examples and arguments with the able assistance of fancy editing and visuals. It can be humourous, but the film is very serious in its intention of making us understand how dramatically copyright laws have evolved in the last 30 years. When I heard the stories about The Rolling Stones suing The Verve for sampling something that they had sampled themselves, when it was pointed out that Walt Disney built his empire on retelling works that were in the public domain (and yet, ironically, the laws that Disney Corp want on copyrighted creations would prevent them from doing exactly that! ), when I was reminded that it’s now possible to patent life, it made me realize that it’s actually spun out of control. I think that this film needs to be seen by just about everyone. I think that a discourse has to be opened up nationwide about the kind of society we want to create. Do we want culture, or consumerism? Or a middle point between the two? And how do we go about achieving that now? In all honesty, as biased as this film is, this is the best documentary that I’ve seen all year. And it certainly has opened up a lot of dialogue sessions in my entourage. See it, think about it, discuss it.